The Sportsman’s Guide offers an extensive selection of ammo, military surplus equipment, shooting supplies and much more. Details: The Sportsman’s Guide started in the Minnesota basement of outdoorsman Gary Olen, back in the winter of 1970. His very first Sportsman’s Guide Catalog came out in 1977 and was loaded with discount-priced gear and clothing to hunters and outdoor enthusiasts. Now with more than 600 employees and shipping to nearly 100 countries worldwide, The Sportsman’s Guide website and catalogs have become synonymous with saving money on everything related to outdoor sports. Brand names in workwear, boots, camping, ammunition, reloading and more like Carhartt®, Remington®, Winchester®, Wrangler® and Browning® to name just a few are featured at great savings in The Sportsman’s Guide. Instructions: To use The Sportsman’s Guide coupon codes you simply enter the appropriate code into the Coupon Code box and click the “Apply” button. Your eligible discount will be displayed and you can continue on with your checkout process. 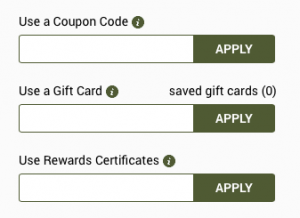 Exclusions: Some Sportsman’s Guide coupon codes have product limitations and brand exclusions. Sometimes a minimum order size is required or certain brands or types of products (clearance items, sale items, etc.) are not eligible for discounting. Be sure to review the “fine print” for any additional exclusions (usually published at sportsmansguide.com). Finally, it’s important to know that some products and orders simply cannot be discounted. For new customers only. Enter coupon code during checkout. Receive 20% off your merchandise total on any order up to the first $150 (excludes Guns and Buyer’s Club Membership fee). $30.00 off maximum value. Can only be used once. Enter coupon code during checkout. Excludes Guns and Buyer’s Club Membership fee. Can only be used once. Enter coupon code during checkout. Minimum order cannot include Buyer’s Club Membership fees. Heavy/bulky charges and Gun charges still apply. Does not apply to Canadian or International Orders. Alaska and Hawaii charges still apply.